Dr. James Lennon is a board-certified physician. 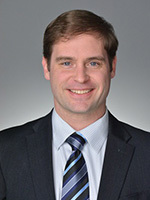 Prior to joining Georgia Cancer Specialists, Dr. Lennon was a fellow at Lankenau Medical Center in Philadelphia, served as the expert reviewer for content for breastcancer.org, and volunteered at numerous local community organizations. He is a graduate of Georgia College & State University. He has special interests in prostate cancer, gynecologic malignancies, and hematologic disorders—in particular, myelodysplastic syndromes and myeloma. He is a member of the American Society of Hematology and the American Society of Clinical Oncology.